One of your roles as manager is to keep a schedule of games and record the result of league games with the South Central District (SCD). To gain access to your team, you will need to set up an account on the South Central District (if you don't have one) and assign yourself as manager to your team. The two primary activities you will perform on the SCD website are entering/editing games and recording results of league games. To do both, you must access your team's page on the SCD website. Login to the SCD website with your email address and password. Click on "Sign In" in upper right corner. After logging in, you can access your team's page by placing the cursor of your mouse on "Team" in the top, horizontal menu. This will reveal a new menu. In the new menu, place your cursor on "Choose a Team". This will reveal a menu with a long list of divisions separated by gender, age group, and division. Placing the cursor on a division will reveal the teams in that division. After you've found your team in the menu, click on it to access your team's page. 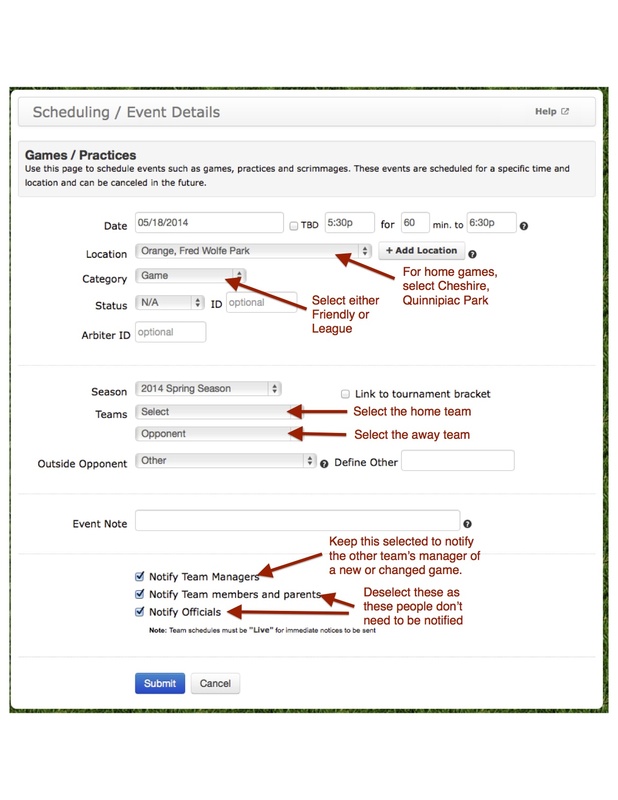 To edit your team's schedule, click on "Schedule" in the left, vertical menu. This will take you to your team's schedule. From this page you can add, edit or delete a game. Click for a guide. To add a game, click on the Options Menu and select Add Event. Click for a guide. 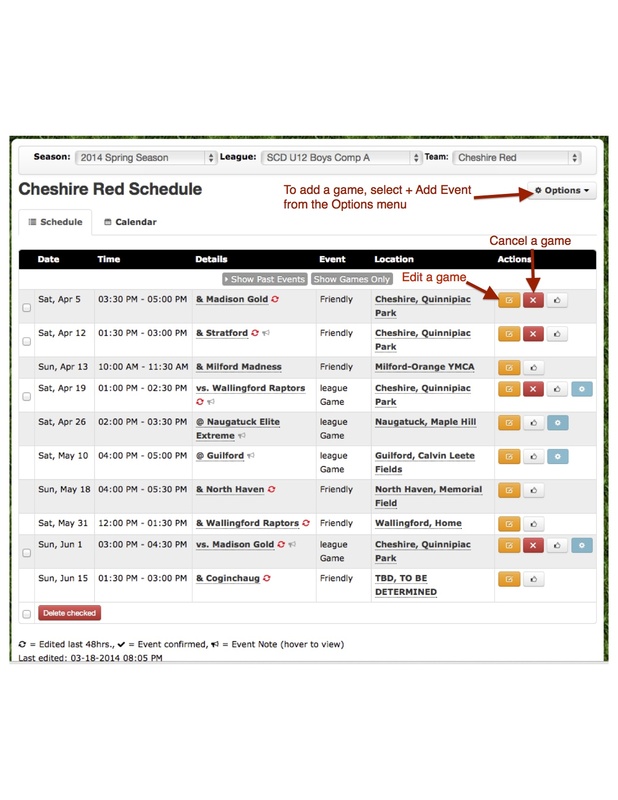 If a field is available, please email the game information (your team, game date and time, opponent, type of game: league or friendly) to who will add the game to the Master Game Schedule. You should periodically check the accuracy of your team's home games on the Master Schedule because our referee assignor assigns referees based off of this schedule. Contact the manager of the opposing team and confirm the date and time of the game. If it is a home game, send the manager directions to our fields. If it is an away game, get directions from the opposing team's manager and send them to your team's parents. Send a reminder to the parents of the date, time and location of the game and ask that they inform you if their child cannot make the game. If it is away game, include directions to the game in the email. If your team employs a rotating roster (i.e. only some players on the roster are invited to play in each game), send your parents a list of the players on the roster for the game. If it is a home game, check that the game is entered correctly on the Master Schedule. If it is a home game, Patty will send a spreadsheet with all the home games and assigned referees. Confirm that the date and time of your game are correct. Make sure that you have a current roster and all of your player passes. We will provide you with a PDF version of the roster that you can print. At the game, referees will ask for the roster and player passes. Remember to collect the player passes after the game. If it's a league game, enter the score into the SCD website. Usually, the team which wins will enter the score. Scores of friendly games do not need to be entered.